This is a rectangular Loiterers Take Notice porcelain sign. This particular Loiterers Take Notice sign is black with white text. It reads, “Loiterers Take Notice, Persons Loitering In This Toilet, Or Marking The Walls Or Doors, Will Be Arrested & Prosecuted. 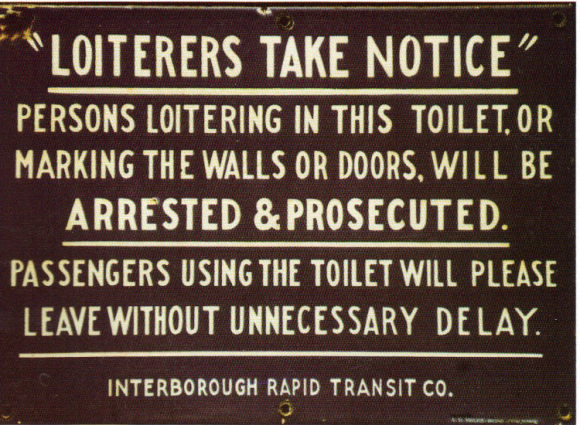 Passengers Using The Toilet Will Please Leave Without Unnecessary Delay., Interborough Rapid Transit Co.”.